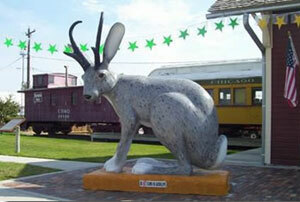 Home to the infamous "Jackalope", Douglas Wyoming is a popular stop when traveling in the Wild West! The town of Douglas ... is small town America at its best! In fact, it was rated "One of the Best small towns" in America! This area of east central Wyoming is the home of many historic trails rich in their history and rugged scenery. The mountain ranges and foothills offer refuge to elk, bear and deer with herds of antelope foraging on the the diverse landscape. Recreationists find Douglas equally appealing. The mountains to the south, including 10,000-foot Laramie Peak, and the Thunder Basin National Grassland to the north, offer camping, hiking, horseback riding trails and other outdoor opportunities. Glendo Reservoir, perfect for camping and water recreation, is located west of Douglas. The town of Douglas sits on the banks of the North Platte River, on the path from/to Denver, Colorado, Yellowstone National Park, or the Black Hills of South Dakota. Other attractions of the area are: the Wyoming State Fairgrounds, the Wyoming Pioneer Memorial Museum, Douglas Railroad Interpretive Center, Oregon Trail and Historic Marker, Fort Fetterman, Ayres Natural Bridge, Sir Barton Memorial Statue - the First Triple Crown Winner in the United States, Laramie peak in the medicine Bow National Forest, Esterbrook Recreational Area and Friend Park Campground. This area is also noted for its frequent sighting of the elusive "Jackalope". Come visit and try your luck at catching one ... but make sure you get your Jackalope License! And remember ... jackalopes ... jackalopes ... jackalopes .. they're everywhere! The Wyoming Pioneer Memorial Museum houses the state's finest collection of Indian and pioneer artifacts both civilian and military, including one of the first school houses built in Wyoming and a tepee from the "Dances with Wolves"